As the gods’ power dwindled, they realized they were no longer a going concern with mortals. In a last-ditch effort to once again maintain their deity power and status, they form rock groups and compete in the most epic battle of the bands humanity has ever seen or heard. As you can imagine, tickets are surprisingly expensive, but the venues are outstanding. 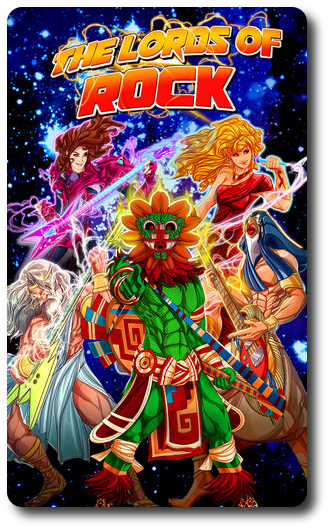 The Lords of Rock, designed by Dave Killingsworth, Dave Ferguson, and to be published by SolarFlare Games, will reportedly be comprised of 8 Band Leader cards (2 per player), 40 Band God Cards (10 per player), 76 Set List cards, 34 Venue cards, 4 Celestial Pantheon Power cards, and 70 Soul Stones tokens (20 large, 50 small). As this is a review of a prepublished game, I cannot comment on the game component quality. The artwork by Andora Cidonia is outstanding and hilarious. Depicted are the major Greek, Aztec, Norse, and Egyptian gods and goddesses decked out in rock apparel and in various poses that clearly shows they are the Pantheons of Power Rock. To set up the game, first separate the 8 Band Leader cards and place them into their matching pantheons. Second, separate the 40 Band God cards and place them into their matching pantheons. Third, shuffle the 34 Venue cards and place the deck face-down to one side of the game playing area. Fifth, Separate the 4 Celestial Pantheon Power cards and set them to one side of the game playing area or remove them from the game. Sixth, determine who will be the first player. This player is referred to as the “Anchor Band”. Then deal each player 4 Venue cards. Seventh, each player looks at their hand of Venue cards, picks one to keep, and then passes the remaining 3 Venue cards to the opponent on their left. The players then pick another Venue card to keep, passing the remaining cards. This continues until there are no more Venue cards to pass. Eighth, starting with the Anchor Band player, each person selects 1 pantheon to play with. All cards associated with the selected pantheon (Greek, Aztec, etc.) are taken by that player. Ninth, all players now simultaneously build their band (referred to as “recruitment” in the game). 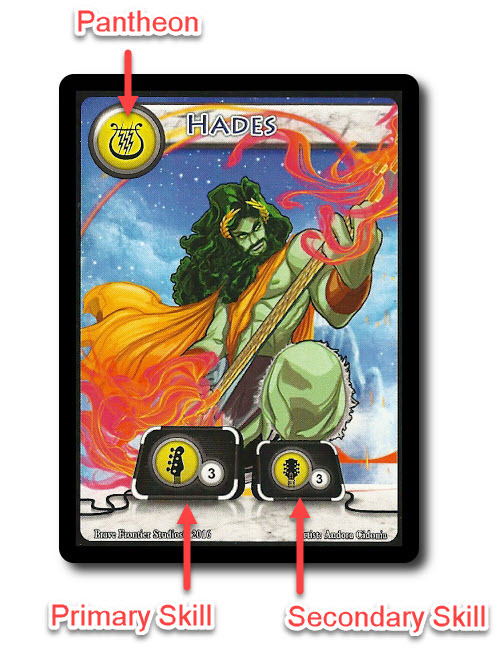 From their hand of God cards, they select 1 Lead God (noted with a star symbol), determining which primary skill their selected Band Leader has (which are vocals, guitar, bass, or drums). 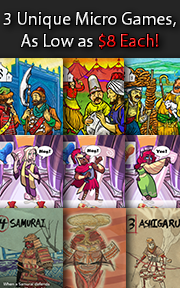 Tenth, from their remaining God cards, the players now select 1 Band God card to cover each of the missing skills. This is done by reviewing the Band God card’s primary skill. 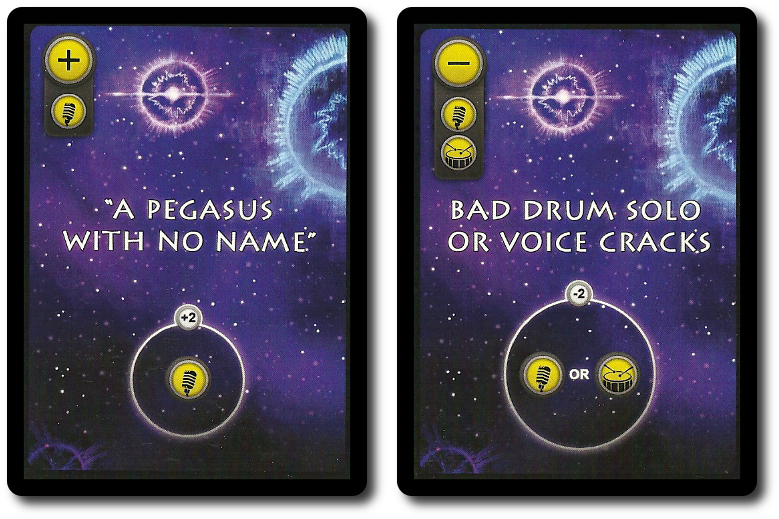 When completed, each player will have 4 cards that represent their band. These cards are placed face-down in front of them in a row. When every player has placed their cards, they reveal their selected band members by turning the cards face-up. Eleventh, each player is dealt 7 Set List cards. Place the Soul Stones to one side of the game playing area. That’s it for game set up. TIME TO ROCK!!!! The Lords of Rock is played in rounds, where each round represents 1 venue. A game round is summarized here. A player selects 1 Venue card from their hand and places it face-up in the middle of the playing area. The Venue card details where the concert will be held, the size of the venue, the number of fans (souls) that can be won, and the skills necessary to compete. 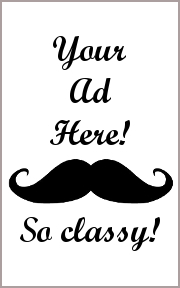 Some Venue cards also have a special bonus that is awarded to the winner of the venue. Starting with the next player in turn order sequence after the Anchor Band player, 1 Set List card is either selected and played or the player passes. If a Set List card is played, it’s either set in front of the player’s own band or set in front of any opponents’ band. Positive (point earning) Set List cards should always be played to the player’s own band face-down, while those Set Lists that will cost points should be played to an opponent’s band face-up. A player can only ever have 2 negative Set lists on their band per round. If the player likes, they can elect to pass before they have played any Set List cards or after. Doing so, however, means the player can no longer play any Set List cards at the current venue. Fortunately, a player who passes can still play a positive Set List card to their band in response to negative Set Lists played by opponents. After a player has played a Set List card or passed, the next player in turn order sequence does the same. This continues until all players have passed. All Set List cards are now flipped face-up. Players now calculate their skills using the positive and negative values noted on the Set List cards, adding and subtracting from their Band God card base values. Players now add the active primary skills points of their pantheon band that are relevant to the venue. Any relevant secondary skills are also applied, but secondary skills can only be added if the god’s or goddess’ primary skill was not used. Bonuses and negatives are then added or subtracted. Players compare their scores. The player with the highest score takes a number of Soul Stones equal to the number value noted on the Venue card’s fan list. If the Venue card has any special effect or ability, resolve it now and give it to the winning player. If the Venue card was not played and won by the Anchor Band player, each player is dealt 3 new Set List cards. If players have more than 10 Set List cards, they must discard down to 10 at this time, unless a previously won Venue card has increased their hand size. A new round now begins as described above with one exception. 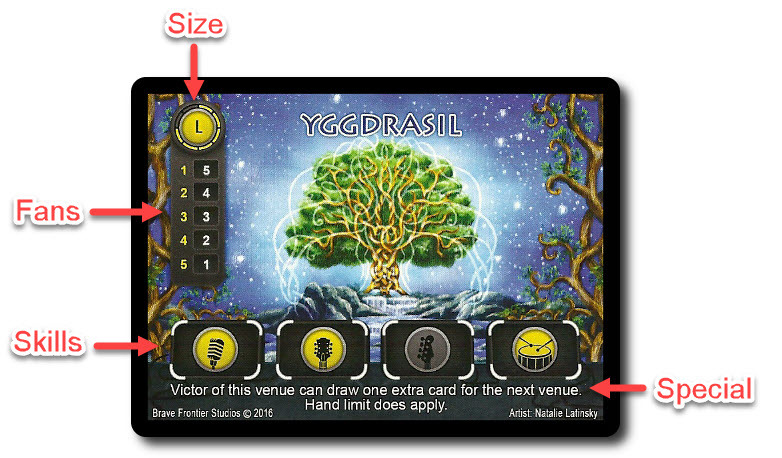 When the new Venue card is played, all players have the option of discarding up to 3 Set List cards, drawing 1 Set List card for each card they discard. When the last Venue card is played and resolved, the game is over. The player with the most Soul Stones wins the game. The winner’s gods and goddesses go on to rule all until the end of time. Be sure to pick up your commemorative tour t-shirts on your way out to eternity. 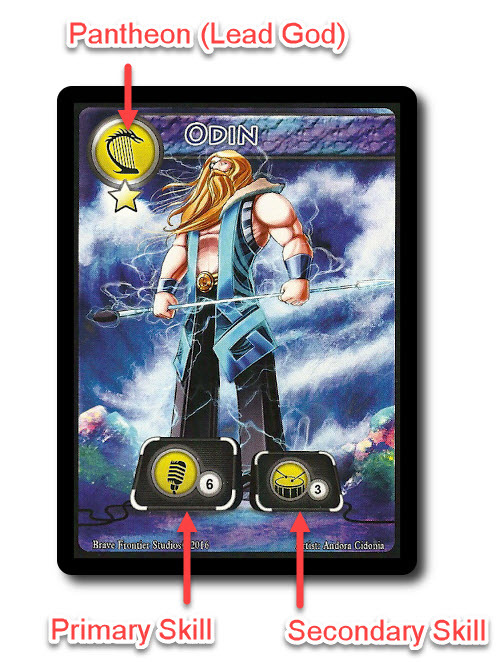 During game set up, each player can be given a Pantheon Power card. Each card is specific to the pantheon owned by the player and describes a power that can be used once per game. To learn more about The Lords of Rock, visit the game publisher’s website or visit the Kickstarter campaign. The Child Geeks figuratively rocked this game. There were even air guitar solos when a Child Geek nailed a venue to win the most souls. According to one Child Geek, “I really like this game. It’s like a battle, but not really. It’s more like a rock concert that’s a battle. Wait, that means it’s a battle.” While the Child Geek went off into a corner to ponder their logic, another Child Geek said, “I like that it has simple numbers, but you have to think about where you want to put your best gods for the show.” Ah, yes! Each god and goddess has a special talent and, if leveraged correctly, will help the player put on a spectacular celestial bash. When the concerts were over, the Child Geeks voted to approve the game. The Parent Geeks also had a great time and laughed a great deal at the fun Set List names, which are mostly creative spoofs on popular songs. As one Parent Geek put it, “The game has a lot of flavor and fun, it is easy to play and has just the right amount of challenge and engagement to make it interesting from start to finish.” Another Parent Geek said, “The game is surprisingly easy to learn, but you have to really watch what people play on you. I am very thankful you can only have 2 negative Set Lists played on your band!” All the Parent Geeks agreed that The Lords of Rock rocked hard with their family and their friends. The Gamer Geeks were immediately impressed with the artwork and thought it very creative and fun that the pantheons of old were rocking out on the celestial stage. According to one Gamer Geek,” The entire game has this Scooby-Doo kind of feel to it. It’s fun and light, but you can tell there is a serious game underneath the covers.” But not too serious, as all the Gamer Geeks agreed that The Lords of Rock was basically a pretty easy numbers game where players could fudge their odds easily with the only limitation being Set List cards in their hand. Still they loved it. As one Gamer Geek put it, “I keep remembering Guitar Hero when playing this game. I have no idea why, but I can tell you this. I’m having a great time.” All the Gamer Geeks agreed that The Lords of Rock would make a great filler game and would be most welcome at their elitist table again. The Lords of Rock is very straight forward in its execution, simplistic in its design, and full of fun. The game designer has taken the fluff out of the game play and placed it in the game’s theme. This means the players get to enjoy a visual feast of color and humor, while the game underneath the gloss is played out without any issues. Some would say this makes it a “simple game”, but I would argue that the game is “simple to play”, which is not the same thing. The games’ big challenge is card management. You have to determine how many Set List cards you want to burn on a venue and, when it comes time to play your own Venue card, selecting the right one that best compliments your band and current Set List cards. The math is easy, so it doesn’t take long, but players do have to do several rounds of number crunching. Nothing about the game feels monotonous, even though every round is the same. What makes it feel different each time are the subtle bonuses and penalties that are played out, the different values of souls to be won, and the size of the venue which may or may not influence the round. In short, each round, while played the same, presents the players with a new question to ponder. Do you go for it all, hold back and get just enough to make it worth your while, or completely ditch the venue? The answer is not always easy. I very much enjoyed The Lords of Rock. The theme is great, the game play is smooth, and the time it takes to teach and get to the table is perfect. It’s a light to semi-medium game at most, but it provides a great deal of fun making it well worth my time. If you think a game about rocking gods and goddesses battling it out in crazy locations in hopes of controlling the know “everything” and beyond is an interesting premise, do give this game a play. Tagged Card Games, Child Geek Approved, Fantasy Games, Father Geek Approved, Gamer Geek Approved, Parent Geek Approved, Prepublished Games. Bookmark the permalink.